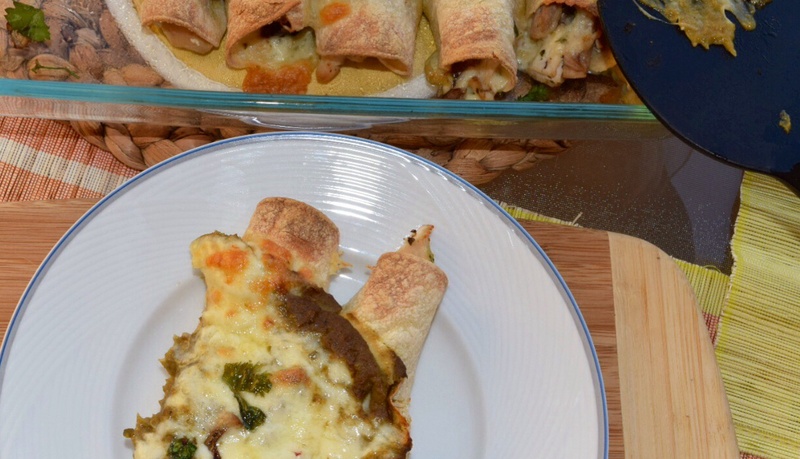 Chicken Enchiladas with Homemade Hatch Chile Sauce – T.W.O. Published on October 7, 2014 October 1, 2014 by T.W.O. Taco Tuesday? How about Enchilada Tuesday!?!? Yes! Hatch chilies are in season, so T.W.O. decided to make a homemade enchilada sauce. And boy did we turn up the heat! Hatch chilies compliment the chicken and pepper jack cheese nicely. Grab your apron and lets start cooking! 1. Preheat oven to a broil. Make sure the racks are positioned in the middle of the oven. 2. Places the hatch chilies on a baking sheet lines with foil and broil for about 15 minutes, turning them halfway through. 3. Remove from the oven and reduce heat of the oven to 400°. Once the chilies are cooled, pull the skins off and remove the steams and seeds. 4. Heat the olive oil in a large skillet over medium heat. Add garlic and cook for 1 minute. Add the chilies and season with salt and pepper. Cook for 2 minutes and then add 1 ¼ cups chicken broth. Bring the mixture to a simmer and let reduce for 10 minutes. 5. Place the chile mixture into a blender and blend on low until the mixture starts to look like a pesto. Set aside. 6. 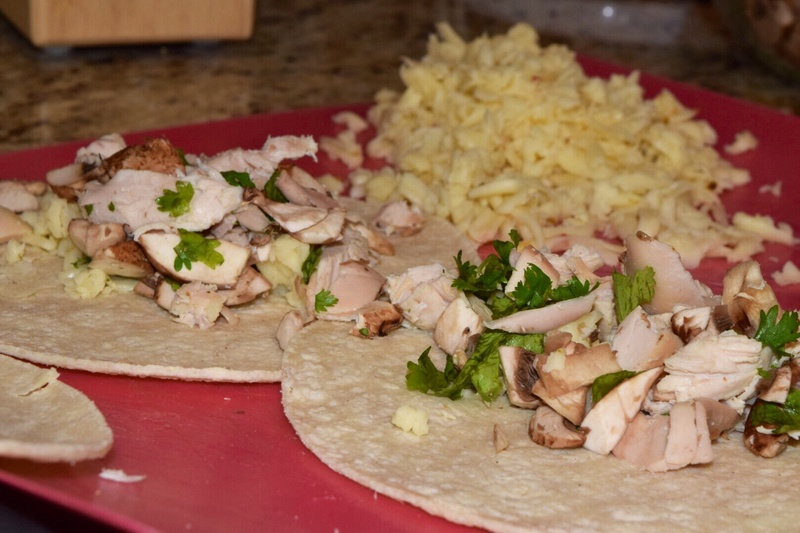 In a bowl mix together the shredded chicken, mushroom and cilantro. Set aside. 7. Using the same skillet, add 2 ½ cups chicken broth and bring to a simmer. 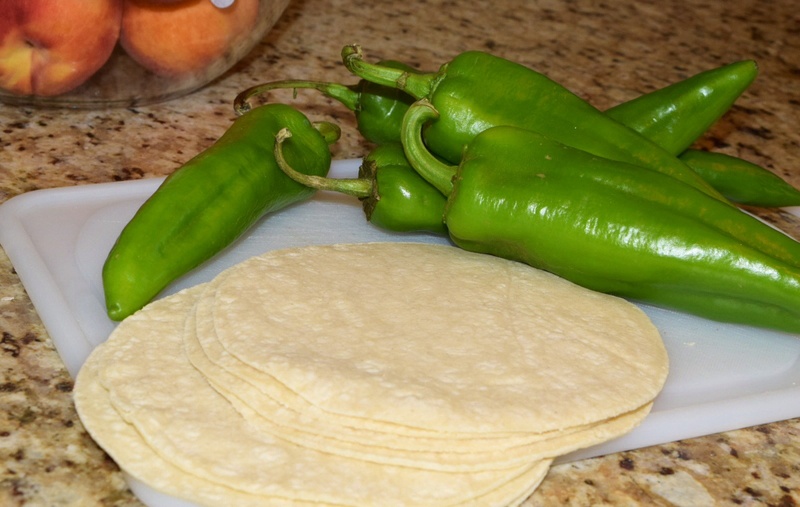 Dip each tortilla in the hot broth to moisten and place on a baking sheet. Repeat with the remaining 9 tortillas. 8. 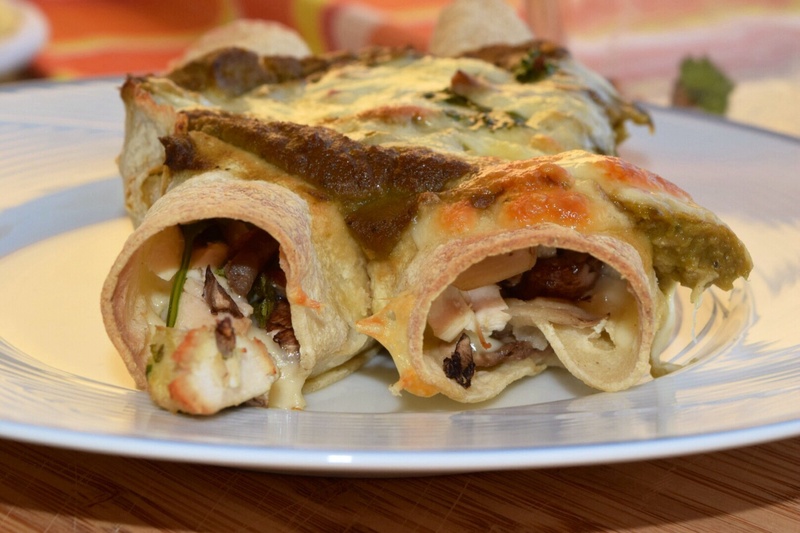 Add 2 teaspoons of cheese to each tortilla and the chicken and mushroom mixture. 9. 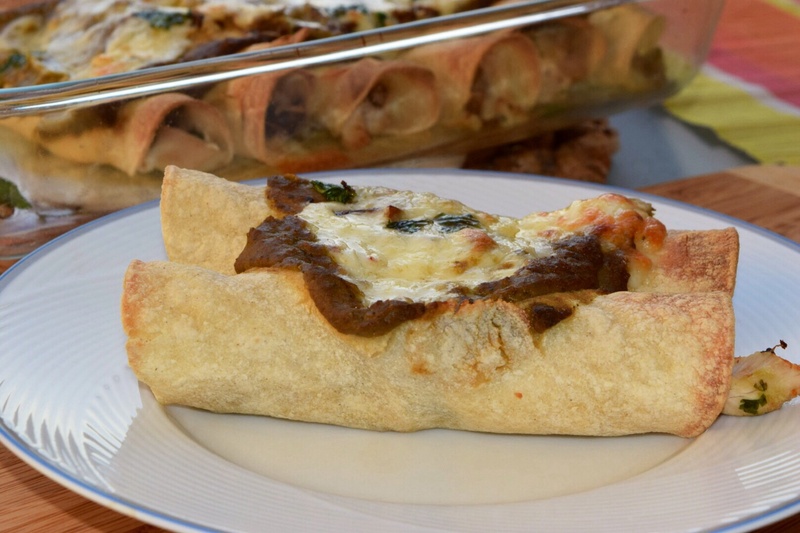 Roll them up and place in a 9×13 baking dish, seam side down. 10. 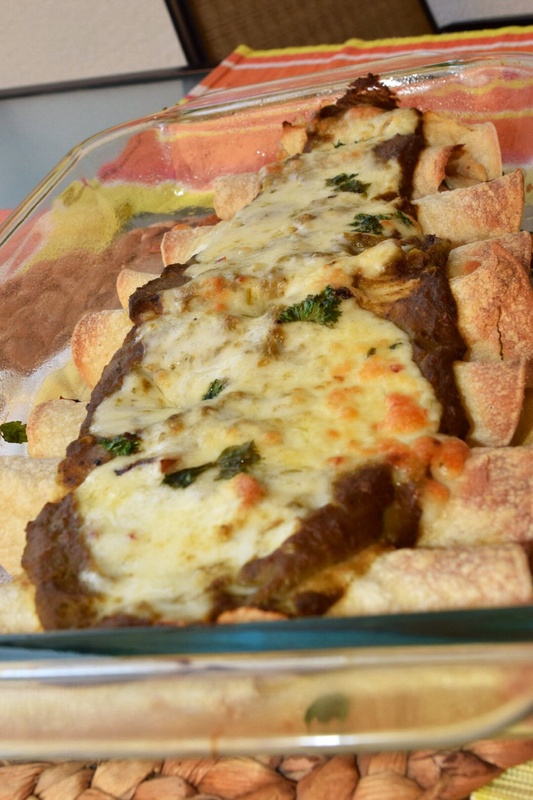 Pour the chile sauce over the enchiladas, leaving the edges exposed. Top with the remaining shredded cheese. 11. Bake in the middle rack for 15 minutes or until the cheese is melted. 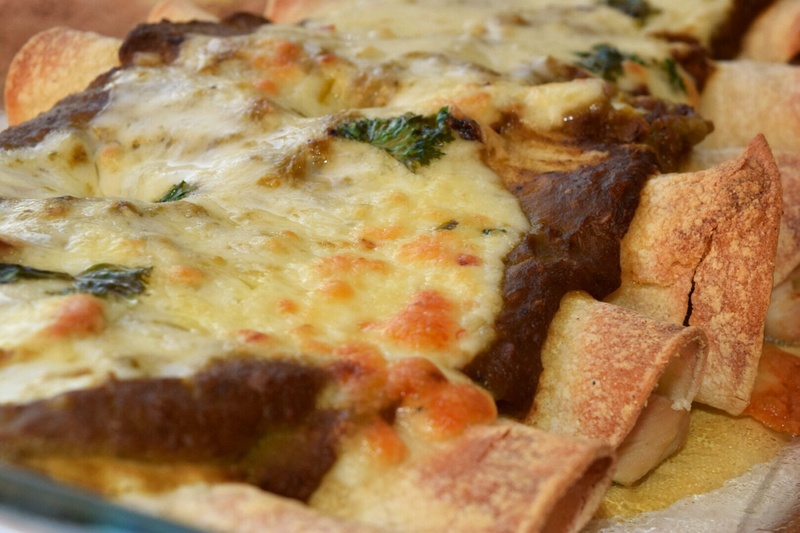 Once melted, turn the oven to broil and cook until the cheese is brown. 12. Remove from the oven and let sit for about 5 minutes. 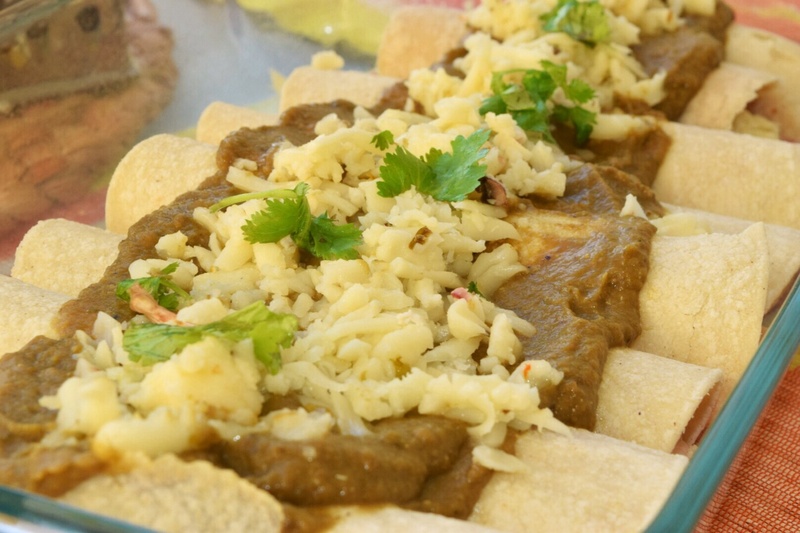 Serve and garnish with cilantro, avocado, lime and anything else your heart desires!